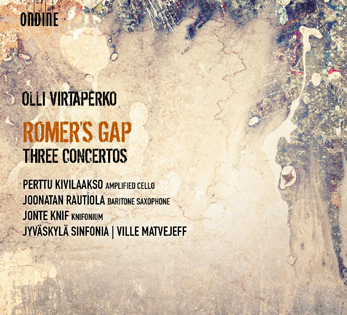 This exciting new release of contemporary music includes three new concertos by Finnish composer Olli Virtaperko (b. 1973). The concertos are combining multiple styles from Baroque to prog jazz as well as different performance practices. Romer’s Gap is a concerto for electrically amplified cello featuring as soloist Perttu Kivilaakso, best known as lead cellist in the multi-million selling rock band Apocalyptica. Ambrosian Delights is a concerto for the knifonium, a vacuum-tube-based analogue synthesiser created by Jonte Knif. Multikolor, written for Joonatan Rautiola, is a single-movement work for baritone sax and small chamber orchestra. All three works are recorded by the Jyväskylä Sinfonia under conductor Ville Matvejeff. Olli Virtaperko has enjoyed a multi-faceted career. He studied composition, the Baroque cello and early music performance practice at the University of Edinburgh and at the Sibelius Academy, and on the other hand he was also a vocalist in one of Finland’s most popular rock groups, Ultra Bra. Virtaperko’s musical background feeds directly into his work as a composer, which includes heavy-duty solo concertos and orchestral works but also a number of works for Baroque and Renaissance period instruments and for his own early music group, Ensemble Ambrosius.